We’ve unboxed the Nexus 5 and given you a tutorial on how to unlock the bootloader, so in this video, we’re taking a look at how it compares in hand and in terms of size to a whole bunch of this year’s flagship phones. Since we have most of them in house (outside of the G2), here is how the Nexus 5 stacks up against the HTC One, Moto X, Galaxy S4, Note 3, and Nexus 4. As one would imagine, the build quality isn’t on-par with the HTC One, simply because the Nexus 5 is all plastic. But with its weight so low, it feels a lot better in hand, at least in my opinion. If you want the best feeling device of the lot, I’d still go with the Moto X. Motorola really has crafted this phone so perfectly for anyone’s hand. Coming from it to the Nexus 5, you can instantly notice the size difference. That doesn’t mean the N5 feels bad by any means, in fact, it feels great with its matte finish. 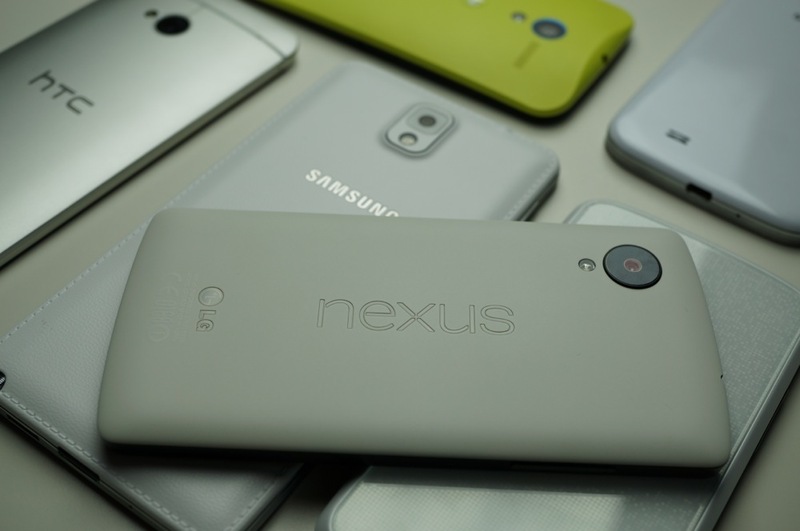 In terms of specs, you can’t really beat what the Nexus 5 has going for it. It has next-gen or currently top tier everything from its 1080p display to the Snapdragon 800 processor. The only real questions we have are whether or not the camera is any good, and if the battery life can hang with the pros like the Moto X and G2. Those tests will come later, for now, let’s look at these comparisons.